Joining Ginny at Small Things for Yarn Along . . . .
A few days before Christmas, I trotted my crazy self over to the LYS for a tutorial on knitting ruffled scarves. It was a fun 45 minutes and I found some beautiful soft Rowan yarn. The only problem is I have yet to knit said scarf. It's a fairly simple process if you remember it. So it's back to my notes and YouTube to see if I can jog my memory. If I can figure it out, this scarf will be faaabulous dahling! I am also taking a minute or two to read Making Color Sing, a Christmas gift from my hubs. It looks a like a pretty interesting watercolor book. I am working on some pieces for a show in the Summer and already thinking of things for Open Studio in November. It should be fun to experiment a bit. What are you making and reading? It's Wednesday. I can't believe that we have already arrived at the second Yarn Along of the year-wow! If this is a measure of the weeks to come, then this year will blast by just like 2012. Joining Ginny and friends today . . . .
After weeks and weeks, which turned into months, I finally finished that cray Azkaban scarf for Elijah at 1:30am on Christmas Eve. At that point, I was simply attaching the fringe. It was simple yet tedious because I had cast on so many stitches. Most importantly, though, Elijah loved loved loved the scarf! Yay! It was such a simple and enjoyable pattern that even after swearing off, I will be making another-this time for Poppa Bill, but shorter and narrower-lesson learned. Elijah wore the scarf all during the holidays and would wear it to school if I would let him. I have too many memories of left-behind backpacks, homework, boots and backpacks to be that brave yet. So he wears it on weekends and when he deems appropriate drapes it over his snowmen. As for reading, I am in the midst of several books (something I swore off of doing but find I have to adjust that promise to the reality of my life). First I am skimming through Organized Simplicity as well as Simple Country Wisdom. Both of these books are helping me "firm up" a workable routine for home stuff and work stuff. I also referred to Heather's awesome housekeeping routine to provide a shape for my days, weeks and months. Things have worked out well so far and life feels a bit more manageable. Things are by no means perfect but they do run more smoothly. I don't know if it's my attitude, my desperation or readiness, but I think I have found a flexible approach to dealing with all the work of tending to a home while tending to myself and others. As for a novel, I am reading Animal, Vegetable, Miracle. I had no idea the water in Tuscon was in the state it is in. It's a scary, but great read so far. What are you reading and making? It's Wednesday and time for Yarn Along with Ginny. So okay this Azkaban scarf is officially longer than my very tall three year old. It's about 44 and 1/2 inches long and I am still.not.done. Help me. Despite the drama, I am enjoying knitting it because it's easy and it's Harry Potter related and my son will love it (if I ever finish). However, despite knitting during Nutcracker rehearsals, ballet classes, late at night and some during the day, this cray cray scarf takes a loooonnng time to lengthen. That being said I haven't been reading too much due to this scarf. When I have had a moment (usually when Elijah is around and awake) I have been reading Home Comforts (this book makes so much sense; perhaps I am relating to the author's lawyer brain), and A Christmas Memory by Truman Capote. I read this with the kids. I enjoy Capote's writing so much and it's cool to watch the kiddos enjoy it too. He had such a way with language. Given the state of Elijah's gift, the calendar, and the fact that I have some "to-do" tasks gnawing at the back of my head, I gotta bounce. Hopefully by this time next week, I'll be putting on the fringes. What are you making and reading this week? Joining Ginny for the party at Yarn Along . . . . So this week is kind of the same as last week, except that I am mercifully further along on Elijah's Azkaban scarf. I am almost at the end of The Goblet of Fire too (man these books are addictive). I do think that me and this Azkaban scarf are going to be hanging out for a while. I knit when Elijah's not around and I am not trying to paint or take care of a child or something. Helena's ballet classes and Nutcracker rehearsals are best for this. This is a long knit-in-the-round scarf with 100 cast-on stitches. I am enjoying it because it is so easy and Elijah will love it. However, in waiting/trying to be even halfway done with it, I am starting to feel a bit like Sirius- "I"VE DONE MY WAITING-TWELVE YEARS-IN AZKABAN!" Sorry for the yelling, but I had to get the drama across. Christmas will be here soon and I do fear I will stitching still on Christmas Eve. Did I tell you that this is a long scarf knit in the round? Oh yeah, I did. At least it's a fun and easy knit. Also, this project has me feeling all kinds of genius and special, because I get to change colors here and there like a boss. I do think I will have to start Helena's project soon which means a trip to the LYS. And of course I can't knit things for only two of the four kids. Hmmm. It looks like I need to knit faster. Joining Ginny for Yarn Along. Dude has it been forever or what? 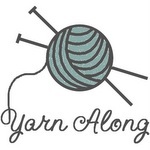 I am happy to be joining in for yarn along this week. I feel I can finally exit my closet of knitting shame. Thanks Tracey for your sweet reminder about the different seasons in our lives. Being a recovering Type A, I do have to reconcile my desire to knit a lot with my present reality. That being said, I finished my mitts. It's just in time too. Rain is pelting outside. My house is cold (it's always colder inside than outside during these first chilly days). I am actually wearing the mitts now to ward off a minor case of frostbite. Boy do I feel warm and hip now. Using my mitt momentum, I have started Elijah's Christmas gift. I think it might take until Christmas to finish it. Elijah is Harry Potter obsessed at the moment so I am knitting him the Azakaban scarf. This baby has 100 cast-on stitches, and there are thirty rows to knit before I get to the first color change. However, this scarf is knit with stockinette throughout so it's super simple. It's good to knit while I surreptitiously watch The Deathly Hallows Part 1. As for reading, I am yielding to Elijah's request to read some Potter books-currently I am reading The Goblet of Fire. I read the first two books a while ago. My grandmother loved Harry Potter, and we would often talk about Harry's adventures and near-death experiences. She was often tickled how Harry could not seem to stay out of trouble no matter how he tried. After she died, I didn't really start up with the books again until Elijah asked that I join him in reading them. These books are addictive and perfect for this cold, rainy New England autumn. What are you reading and knitting lately? Joining Ginny for yarn along . . . . Things are getting busier and busier. It looks like the May Madness is starting to ooze over into June. Thank goodness I have knitting and reading to slow things down a bit. I am working on my second mitt, so things are a steady on that front. I blew through (well mostly) Quiet: The Power of Introverts in a World That Can't Stop Talking. Now that was a wonderful book. I learned a lot about myself. It was a relief to see that other people recognize the frustration that introverts can feel in a world that prizes extroverts. I didn't get to finish the entire book as it was due. I turned it in because I didn't wish to add to my already fined-up account. I started reading If These Walls Could Talk: An Intimate History of the Home. What an interesting book. It has all kinds of information on some of the more practical (read kinda gross or embarrassing) history of us and our homes. I have learned the Western history of the bed, underwear and baths. The bedroom has only recently become a private space. Back in the nasty centuries when people refused to bath because they thought water was dangerous (they were partly right), they used underwear to keep themselves clean. Gross Alert: So yeah, everything a body can produce was "taken care of" by the linen undergarments. A person then washed his or her unmentionables instead of washing the body. Ugh. The Tudor and Stuart periods were pretty darn nasty. I have also learned from this book that urine is an excellent stain remover. The servants used to wash out those stubborn stains that the lords and ladies collected on their hunts with basins full of the stuff. Amazing. So if you have a curiosity about the history of things we don't talk about in public (usually), then you can't go wrong with this one. Grossness Over. Another Wednesday and I fear I am not quite where I wanted to be with my knitting, but that I am where I need to be. There has been much to-doing around here of late which has meant less time knitting and reading. I have cast off my first mitt. Now on to the second. I am saving the thumbs for last. So far so good. I tried my mitt on and it seems that even if the thumbs don't work, the mitts will still; they'll just be fingerless and thumbless mitts. It is natural but still amazing to gain new skills from knitting a lot. I dropped a few stitches-don't know how- while making these. I managed to fix them-don't know how-but they seemed all repaired and knitted. I hope they stay that way. Somehow though I was able to figure out where the lost and dropped stitch was. I am sure for most of you such picking up dropped stitches is a quotidian act. It was monumental for me. I was afraid of picking up dropped stitches from the moment I started knitting. It's a bit embarassing to admit that I ripped out things rather than pick up the stitches. I just couldn't see them. Thank goodness the projects were tiny. I have still been enjoying The Gentle Art of Domesticity. Jane Brocket has found all sorts of domestic art. They are quite enjoyable. One of my favorites is Train Landscape by Eric Ravilious. I am also reading Quiet: The Power of Introverts in a World That Can't Stop Talking. All I can say is "Amen". This book gives me great insight about myself and I daresay justifies many of my "quirks". I should finish up quickly as it can only be lent from the library for only two weeks. Joining Ginny and many others for yarn along. . . . I simply cannot believe it's Wednesday again. I know I say it every week, but every week I am shocked and amazed at how fast time speeds away from us. When I was a child, days just went on forever. So my mitts are moving along thanks to sweet Tracey of Clover. Thanks to her I was able to make my thumb hole. It was a weird thing for me-making an intentional space in my knitting. I make unitentional spaces frequently enough. The mitt is not hard as it is mostly knitting in the round with no purling. I should be done with the body of the first mitt in less than an hour, then it's on to knitting the actual thumb and the next mitt. Yeah, I'm going to be making more of these bad boys. People better watch out come Christmas. When I can, I have been devouring The Gentle Art of Domesticity. Greg has made the oatmeal cookies from this book, and I will be making the chewy flapjacks hopefully soon. I am becoming rather familiar with Lyle's Golden Syrup. I absolutely love that lion on the can. If you are looking for it, I usually find mine at Whole Paycheck. The author, Jane Brocket, says it all when she states: "Embedded in the gentle arts is a slyly subversive streak that encourages free thought, individuality, creative self-expressionism, imaginative thought processes and not a little self-determination." The other book I picked up was Steal Like an Artist. I enjoyed this selection very much. It's a quick read and very inspiring. One of my favorite pieces of advice from the author, Austin Kleon, is to "use our hands". One way to do this is to get away from the screens. As much as I love my computer and my community that is found "on" it, I love analog stuff-pens, pencils, paints, office supplies. I am a semi-luddite. This book, like The Gentle Art of Domesticity, gave me "permission" to revel in that. Kleon also encourages us to engage and nourish our "side projects" as they fuel our main passion(s). As someone who has a lot of interests, this was refreshing to read. It's Wednesday again and time to join Ginny for yarn along. Well now that there is a bit more time freed up, I thought I would be able to work on my Toasty mitts. Unfortunately I caught some crazy cold via Eden-oh man, walking, lovable petri dishes children are. So now between coughing fits and laying flat out, and child care, I work on my mitts and read a bit. The mitts are coming along very well-simple stockinette stitch. I haven't gotten to the thumb hole yet so we'll see how I'm feeling about the project in a few rows. As for books, I am reading The Gentle Art of Domesticity. It is a lovely and inspiring book. Even though I have yet to finish it, I know I will definitely return to it again. I also have a stack of Maurice Sendak books to read to myself and to any of the kiddos who would like to listen. Some of my favorites of his are Pierre, In the Night Kitchen, and Outside Over There even though that one kind of freaks me out. RIP Mr. Sendak.